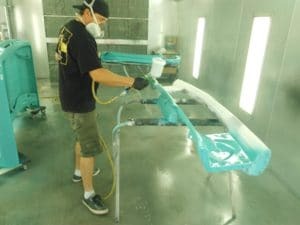 Creating The Perfect Paint Job, Step Seven: Paint Process | DH Automotive, Inc. Welcome back everyone! 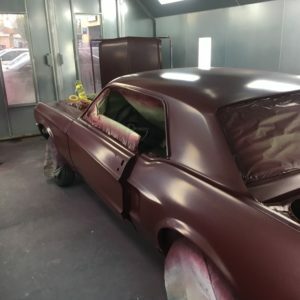 This month we’re finally getting down to the actual paint process. 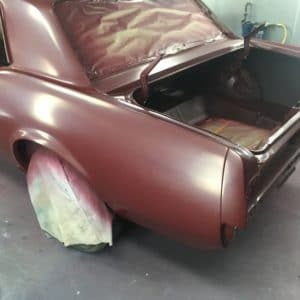 I know there’s much preparation, but if “80% of success is showing up” as Woody Allen stated and you want a paint job you can be proud of, it’s important to take each step and do the best you can. Before we dive in, though, let’s talk little bit about paint. 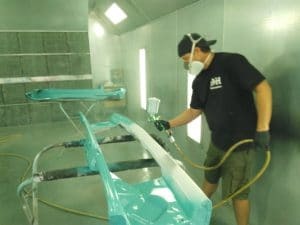 There are several options to choose from – single stage paint, water based paint, etc. 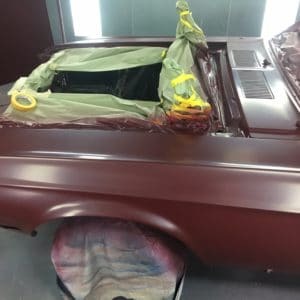 For the purpose of this post we are going to stick with my favorite: the two stage base coat (which is the color) and clearcoat (which will give it that shine) I’ve done all three, but understand that I can control the process, which for a control freak like me works fantastic. 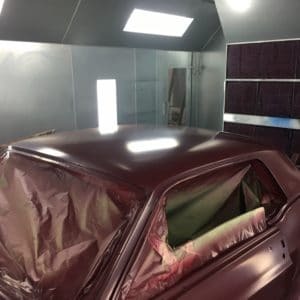 Now, after the car/truck has been masked and prepared, we will be using a paint booth. Yes, some guys have shot outdoors (not naming anyone! ), but we want to be environmentally friendly. It’s also it’s a big no-no in the state of California. The last thing you need is a visit from the Environmental Protection Agency! Ok, so you’ve got to prepare all your supplies. The most important thing is to have several measuring cups; you can pick up a half dozen at your local automotive paint supplies. You want to stay away from eye balling it and stick to the formula – that what’s it for! The first thing I do before I begin is a slow down – take a few minutes to get into the zone, and say a prayer to the creative gods. 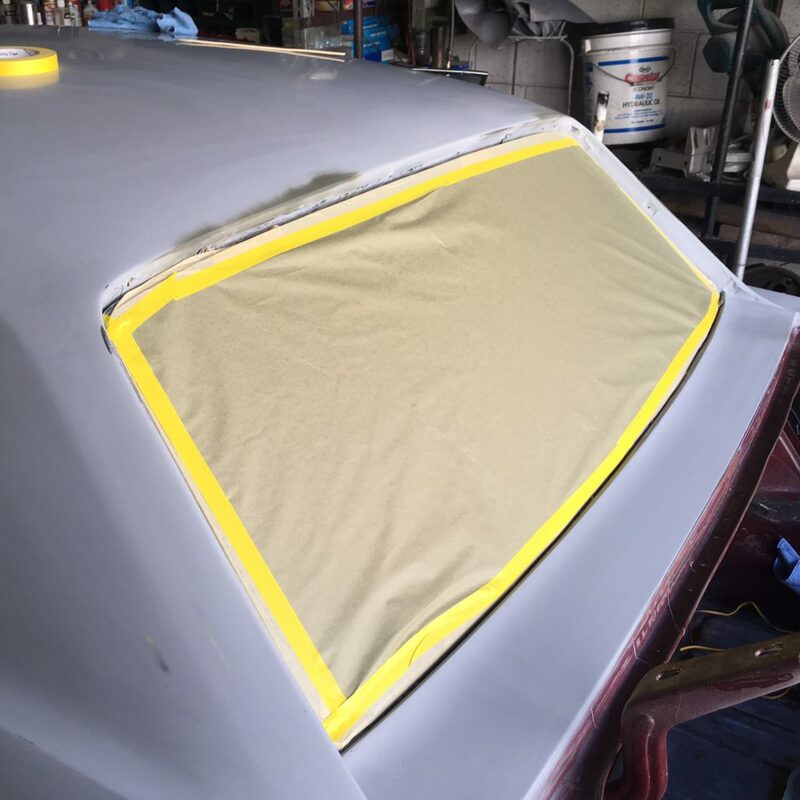 I then I head out over the vehicle with a tack rag using high pressure (55 psi) on my spray gun to make sure to pick up the last tiny specs of dust. Now that the vehicle is clean, I’ve mixed the paint with reducer. There are three types of reducers slow, medium, & fast. The slow reducer is used when it is hot, medium for mild days, and fast for cold days. I’m wearing paper moon suit, gloves, and a face mask in order to avoid getting high from the fumes. When I start, I shoot the roof first, the highest point, and my gun pressure is around 20 psi. I’m in robot mode, I utilize long even strokes over one side then I’ll go to the other side and do the same. While doing this, I make sure that I keep watch on my paint hose, to make sure it doesn’t leave a trail over my fresh paint. The coat is light, as I’m not trying to cover up the primer and I just want to get a base coat. Read on the paint can on flash times, which is the time between coats. This is where I always trip up, losing patience and wanting to be Mac daddy and laying down a heavy coat. That is a recipe for sagging paint! 4 to 7 minute is the flash time I set on my phone. When the time is up, I apply a second coat, and then I wait again. 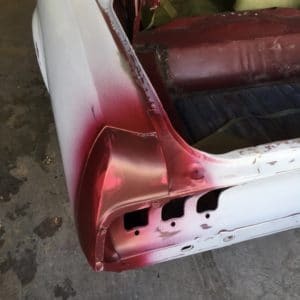 I begin to look for any sand marks or any funkiness going on that comes up through the paint. If I find something, I fetch a bucket of water and 1000 grit sandpaper. I use a small rubber flexible block to sand using the cross hatch method until I’m satisfied that the marks are gone. Clean up using the tack rag, then go back to painting. I’m working quickly because there’s no time to mess around. Time is of the essence, and I’m onto my third coat. By now, I can relax a little as the paint is going on smoothly as I hear “Street of Dreams“ by the Damned, one of my favorite songs to paint to. The paint looks good, no tiger stripes, no runs, and just even coats. Now it’s time for the clear coat. I add the activator, and as a little magic, I add a small amount of fish eye remover and a touch of reducer. 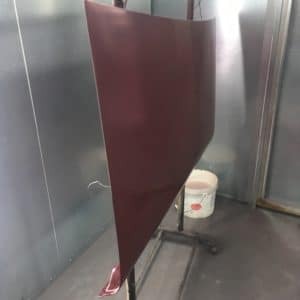 This allows the first coat of clear to bite into the base coat. The pressure on my gun is 35-42 psi, and once again I start on the roof and work my way down. The first coat is again a base, so avoid getting too crazy. It’s just like fogging it on (very light coat). After the first clear coat has been applied I empty out the gun and start anew with just clear and activator. The gun is full and I’m ready to get crazy in a controlled kind of way. The clear goes on smooth, so I come back half space lower and let the clear do its thing. 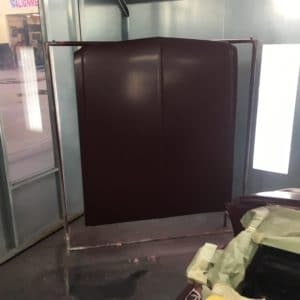 When it comes to the doors, fenders, or other sections of the vehicle that is vertical; I begin the application by starting at the bottom and work my way up. I’ll lay on 3 or 4 thick coats of clear, not worried about issues I find. This is because I know that I will sand off at least one coat which I will discuss in the following post. We will also talk about runs in the clear and how to take them out. Stay tuned for next spine tingling episode until then, hang loose!